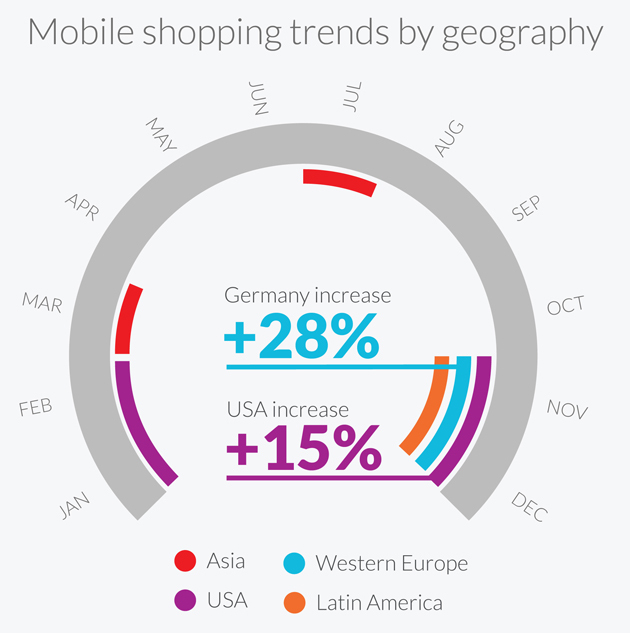 A new report from Opera reveals how global consumers use their mobile devices to shop online. It breaks down mobile shopping trends by time of year, days of the week and geography, and showcases the top mobile sites and advertisers of this holiday season. “Online shopping has become a major force in global markets. And, with the holiday shopping season upon us in the United States, we see mobile’s share of that market accelerating,” says Larry Moores, Vice President for Consumer Mobile Reporting and Analytics at Opera Software. Unlike desktop traffic to e-commerce sites, which tends to peak on Mondays and remains stronger during weekdays than on weekends, mobile shopping traffic is highly concentrated on Sundays. One possible explanation is that many consumers use their mobile devices to browse products over the weekend, then revisit and purchase when they return to their desks on Monday. The day with the lowest mobile shopping traffic is Friday. The Christmas season is the most active time for shopping in the United States, Europe and Latin America. Between November and February, the United States sees an increase of over 15% higher than annual averages in shopping volume. Germany also shows particularly large increases in the number of shoppers during November and December, experiencing an increase of over 28% from its annual average. In Asia, however, March is the peak month for volume, followed closely by July. This is largely due to Ramadan starting in late June and ending in late July this year. When taking a global look at the data, the month that sees the most mobile traffic volume to shopping sites is actually June, while February sees the highest mobile traffic for avid shoppers (those whose mobile behaviors indicate a strong interest in shopping). In the United States, Amazon leads the pack in mobile shopping with a 36.3% market share of traffic volume. Trailing in second is eBay with 16% of the market share, followed by Craigslist with 11.5%. Among the big-box retailers that offer mobile shopping, Walmart sees the highest volume of traffic, followed by Target and Sears. Other U.S. retailers that see an increase in mobile traffic in November include Walgreens, Lowe’s, Macy’s, Kohl’s, Barnes & Noble, Kmart and Nike. On a global scale, Amazon remains the leader but there are some relative newcomers that have taken strong leadership positions in Asia, such as FlipKart in India and Berniaga in Indonesia. In Latin America, mercadolibre has emerged as a top mobile shopping destination. In China, Alibaba is a key player to watch as mobile shopping marketplaces mature. In October and November of this year, the majority of global impressions on the Opera Mediaworks mobile ad platform came from ad campaigns for games, followed by computers and electronics. However, when looking at ad spend, companies selling mobile phone services came out on top, followed by home improvement stores. Apparel brands and jewelry came fairly low on the list. This report’s insights are sourced from anonymous, aggregated data from the 270 million users of Opera Software’s mobile browsers, combined with data from the Opera Mediaworks mobile ad platform, which serves 65 billion ad impressions a month on over 17,500 mobile sites and apps and reaches 800 million consumers globally. Read the full report at http://operamediaworks.com/insights/index.html.